Clovis (ca. 466-511) - With the fall of the Roman Empire in the West, a vacuum was created allowing for the opportunity of one or more new kingdoms to step up and dominate the region which had been under Roman control for so many centuries. And the one which came closest to establishing hegemony was the Kingdom of the Franks. The Franks were yet another Germanic tribe that began occupying Roman territory even earlier than the Goths. They originated in the Rhine Valley, but by the middle of the 4th century had already taken over large swaths of Roman Gaul. There were many different Frankish tribes, just as there were different Gothic tribes, but by the 5th century, two had become more powerful than the others; the Salian and the Ripuarian. Out of the Salian Franks came a man who would unite all the tribes into a single Frankish kingdom. 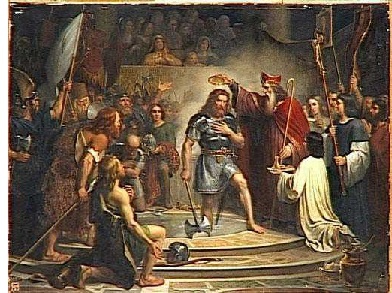 His name was Clovis and he was the first king of the Frankish Empire, and founder of the Merovingian Dynasty. In order to achieve this feat of unification, his reign would be marked by a state of almost constant warfare. He became king of the Salian Franks in 481 at the age of only 15 with the death of his father, Childeric I. His first major battle (and victory) came in 486 at the Battle of Soissons. The domain of Soissons was known as a rump state; that is, when the Western Roman Empire fell in 476, the Gallo-Roman region of Soissons endured, under the rule of Syagrius, as an autonomous state for another decade until conquered by Clovis. He followed that up with victories over the Cambrai and Thuringians, and by 491 had conquered all Frankish kingdoms except the Ripuarian. Now his empire was large enough to draw the attention of the Gothic kingdoms upon which his bordered. So around 493 he made an alliance with the Ostrogoths by giving his sister, Audofleda, to their king Theodoric the Great (see below) in marriage. In 496 he defeated the Alamanni at the Battle of Tolbiac. This is the region in where Paris was located, to which he moved his capital following his victory. He fought an indecisive battle against the Burgundians in 500 at Dijon. Then in 507 came the Battle of Vouillé against the Visigoths (see below). This added the region of Aquitaine to his kingdom and established his southern border at the Pyrenees. He capped off his military career by defeating the most powerful Frankish kingdom next to his own, the Ripuarian in 509. In that year, the Ripuarian capital of Cologne fell to his army and all the Frankish people were at last under his authority. With that, he officially became king of the Franks and established the Merovingian Dynasty which is named for his grandfather, Merovech. It would endure for another two centuries until replaced by the Carolingian Dynasty in the 8th century. Besides his military conquests, the other other major legacy for which he is remembered was his conversion to Catholicism in 496. His wife, Clotilde, a Burgundian, was Catholic and he was baptized on Christmas Day of that year. However, many historians believe his "conversion" was primarily for political reasons, as it served to help unite his growing empire which was largely Catholic. Though his grandfather, Merovech, and father, Childeric I, were also kings, they ruled only over the tribe of Salian Franks. The chronicler for this period in Frankish history is Gregory of Tours.